Hello, and thanks for visiting. My blog has moved and now has a refreshed look. Thanks for your patience as we make the transition. Those who traveled in Titanic’s First Class saw the bandsmen only in a professional capacity, while performing in a particular place at a particular time. Most accounts from First Class passengers mentioned the band in a general sort of way. Helen Churchill Candee’s account described the listening audience more than the bandsmen themselves. But as the bandsmen travelled in Second Class, their fellow passengers in that area of the ship were much more likely to bump into them between sets when they weren’t working: in corridors, on the ship’s deck, possibly even at mealtime. Their memories reflected this close proximity to the musicians. While Juliette Laroche described a performance in Second Class, Lawrence Beesley described seeing a bandsman running to a performance, and Kate Buss and Bertha Lehmann each had opportunity to speak with musicians on a more personal level. Even closer than Second Class passengers were members of the crew. One survivor, First Class stewardesses Violet Jessop, knew Jock Hume personally. The two had sailed together the year before, on Olympic’s maiden voyage. As crew, she was even able to call him by name. In the wake of discussing Titanic’s bands, the musicians and their instruments (as well as who played in which band), here is a quick reference for enthusiasts and lay researchers on how the bandsmen were remembered by Titanic’s survivors. 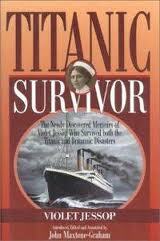 This is a compilation of quotations from personal letters, memoires, and books published on the subject of the sinking of the Titanic. Although the bandsmen were not identified by name by most who recorded the memories, identities have been recovered through deduction. When a particular passage is included beneath a bandsman’s name it is because he was mentioned in it, sometimes in detail. In most of the quotations a bandsman was identified by the instrument he played. Titanic’s saloon orchestra, or trio, played only in First Class, in the Reception Room outside the à la carte Restaurant and Cafe Parisien. Referred to as the ‘luxurious saloon after deck’ by May Futrelle, this was the trio’s one and only performance venue. 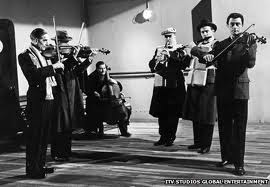 As there was no piano in this location on the ship, three string players filled the positions of this ensemble, led by Jock Hume, first violin and bandleader. There are currently no known accounts that focus on violinist Georges Krins. 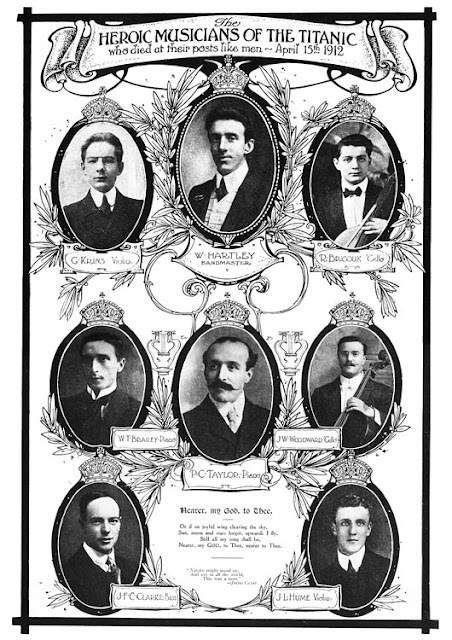 Titanic’s deck band, or quintet, gave six performances daily, alternating between Second and First Classes. They gave three concerts daily in the Second Class Entrance Foyer on C Deck, one in the First Class Entrance Hall at the Boat Deck level of the Grand Staircase, and two more in the Reception Room outside the First Class Dining Saloon on D Deck. 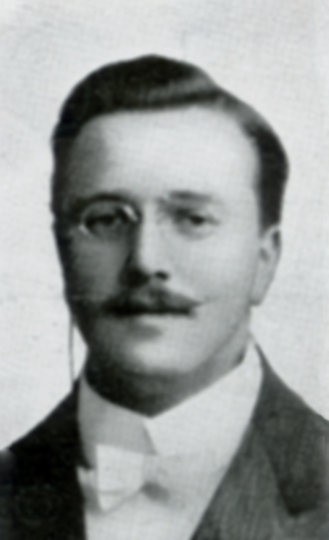 There are currently no known accounts that focus on Titanic musician Percy Taylor, now believed to have been a violist. "Soon after the men had left the starboard side, I saw a bandsman--the ’cellist--come round the vestibule corner from the staircase entrance and run down the now deserted starboard deck, his ’cello trailing behind him, the spike dragging along the floor. This must have been about 12.40 a. m. I suppose the band must have begun to play soon after this and gone on until after 2 a. m. Many brave things were done that night, but none more brave than by those few men playing minute after minute as the ship settled quietly lower and lower in the sea and the sea rose higher and higher to where they stood; the music they played serving alike as their own immortal requiem and their right to be recorded on the rolls of undying fame." Which musicians played in Titanic's trio? Who was bandleader of Titanic's trio? Was Wallace Hartley Titanic's only bandmaster? Titanic's quintet: Which part did Taylor play? Titanic's quintet: Who was the cellist? Titanic's quintet: Who was the pianist? Jessop, V. (1997). Titanic Survivor, Dobbs Ferry, NY: Sheridan House, 1997. pp. 124, 129. The only musician left to place in the quintet is Percy Taylor. Very little is known about the musical side of Taylor, one of the two musicians on Titanic who has traditionally been listed with both cello and piano. The lack of evidence for him seems to be evidence in itself. It is almost as though the press had nothing on him, nor did the Amalgamated Musicians’ Union (who created the famous poster of the bandsmen), so they just made it up to put something there, or copied someone else's supposition. What are the possible reasons so little is known about Taylor? Although he was the only bandsman who was married, he was estranged from his wife, Clara. It appears as though she made no effort whatsoever to help the public to learn more about him after his tragic death, though she was perfectly willing to accept funds raised for the survivors of Titanic’s deceased musicians. So, although he has been credited as playing piano and cello there is an outside possibility that he played neither. As a musician, I searched the information on Titanic’s quintet for sparse evidence on Taylor’s position. With the other bandsmen in place, the only missing part is a stringed instrument that would fill the alto voice. Violin, Viola, Cello, Double-bass, and piano. There is no concrete evidence of any instrument for Taylor. There is only an “aura” of evidence. Liken this to news that a new planet has been discovered far, far away, but scientists can’t actually see the planet, they can only see a gravitational pull that suggests the planet is there. Such is the case with Taylor's instrument. If Taylor had played second violin, Hartley would have been called not just bandleader and violin, but first violin. Hartley was never called that in primary sources, as Jock Hume was. 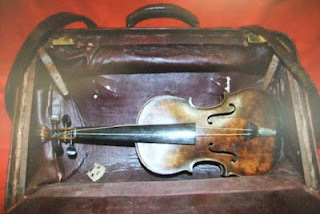 Two passengers had identified only one violin in the group. First Class passenger Helen Churchill Candee had said, “…others said the violin was weak.” Second Class passenger Juliette Laroche had said, “…there is a concert next to me: a violin.…” In the aura of evidence, eyewitness references help us determine that there was only one violin, played by Hartley, and therefore Taylor did not play violin in the quintet, but something else. Although Taylor was credited with playing cello, it would be highly unusual for a quintet to have an instrumentation consisting of two cellos. Laroche’s one reference to two cellos in the quintet came from an incomplete listing of only four out of five musicians, and it is likely that the cello and double bass, both large stringed instruments, were erroneously listed as two cellos. Moreover, a wall separated her from a view of the band. The more accurate picture came from Second Class passenger Kate Buss, who wrote many accounts of the cello and “Cello Man,” all in the singular. In the aura of evidence, one cello means Taylor played something else. It has never been questioned that the quintet had only one double bass and one piano, so it is certain that Taylor played neither. Although the band has at times been depicted with wind instruments (in the 1958 movie A Night To Remember, for example), no primary sources have ever suggested anything other than stringed instruments and the piano. with stringed and wind instruments. If Taylor didn’t play violin (soprano), cello (tenor), double bass (bass) or piano, what did he play? Logic points to the only missing standard instrument that could have balanced the ensemble with the alto voice: the viola. Percy Taylor, the musician we know so little about, has now become our suspect violist. But to make a claim like this I would need to offer a shred of proof. An aura of evidence would not likely be enough to persuade anybody. The proof may come from a familiar passage. Let me repeat a quote that has been posted on Titanic Piano several times, from Titanic’s music agents C. W. & F. N. Black, the musical directors who had hired Titanic’s bandsmen. In several posts including this one, the significance of the listed order of the bandsmen has been brought to light. Now reread this, within the present discussion, paying attention to the order Black listed the musicians, printed vertically. Remember what was said earlier in this post about musicians being listed in order according to their instrument? It seems as though there is nothing random about the listed order of the bandsmen. The fact that Black listed the other four musicians in the correct order according to their instrument makes it believable that Taylor, too, is in order. Where does this place Taylor within the group? The instrument that is notated below the violin and above the cello in a music score is often the viola. After Titanic sank, Charles Black would have been one of the only living men to know all the bandsmen’s names and instruments. His brother, Frederick, would have been the only other. In their office somewhere they had a document on which they had written the names of the quintet’s bandsmen, and the names were written in formal concert order. Hartley’s name appeared first, for his instrument, violin, would appear at the top of a quintet score, would be listed first in a concert program, and, apparently, first in a music agent’s list of bandsmen. This protocol (formality) continued with the rest of the band: Taylor in the spot of the next instrument, which suggests the viola, Woodward in the cello’s position, Clarke, the double bass position, and Brailey, the piano. It is the printed order of names that is significant, that aligns the bandsmen’s names with the instruments they played. And where did Charles Black list Taylor’s name in the five? If the aura of evidence discounts a second violin or second cello, then Taylor fits neatly into the place of the viola. That makes a standard, balanced ensemble. Violin, viola, cello, double bass, piano. Just as an aside, is it ironic or not that Titanic’s one musician who was incorrectly listed for a century was the violist? Often violists are overlooked, play the plinky notes no one pays attention to, provide the harmony to other instruments. Titanic’s violist was probably never asked to play a solo, or ever had the chance to flirt with the ladies. In Juliette Laroche’s list of instruments, the only one not mentioned, either specifically or by implication, was the viola. Yet, there was a viola there. Perhaps it is time for the violists of the world to stand up and recognize one of their own. An obituary, or a statue, or a plaque somewhere in London. Perhaps it is finally time for someone to organize a proper tribute to Titanic’s violist, Percy Taylor. Titanic's quintet: How many cellos? Titanic's quintet: Who was the quintet's cellist? No one tells the violist’s fate like Lemony Snicket in “The Composer is Dead,” which is narrated to music by composer Nathaniel Stookey. You will find the passage on the viola at 3:20. In Titanic lore there have always been two pianists listed in the instrument lineup. Posters and photomontages of Titanic’s bandsmen that were printed after the disaster identified Theodore Brailey and Percy Taylor as the two. Though there were likely several musicians who could play the piano, it is safe to say that on Titanic’s maiden voyage there was only one hired pianist, who played in the five-piece deck band. With Brailey and Taylor as the two candidates, I have honestly gone back and forth between them. In the historical notes of my piano books, the first edition has it one way, the second edition, the other. By the age of fourteen Brailey was playing piano professionally in the Kensington Palace Hotel orchestra in West London. The conductor, Simon Von Lier, noted that Brailey was a “highly efficient pianist,” which suggests that he had an aptitude for picking music up quickly and reading well at sight. A month before his fifteenth birthday, on October 9, 1902, Brailey signed up for the army in a regiment called the Lancashire Fusiliers. Just over a year later, while stationed in Barbados, he was appointed as a bandsman. His late teens were spent studying music, for in March, 1904, he enrolled at the Royal Military School of Music at Kneller Hall in Twickenham, just outside London. He studied there for about two years. He completed his musical studies and military training in January 1906 and was awarded certificates of accomplishment on flute and cello (it is unknown whether he also studied piano). 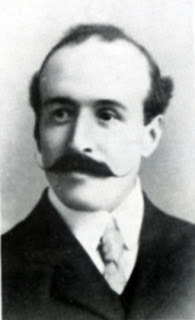 Then, with less than five years of military life under his belt, Brailey left the army in February 1907 by buying himself out. In the years that spanned his early twenties (1907-1912) Brailey held several positions as a professional musician. In Southport, Lancashire he played with the Pier Pavilion orchestra, and made several voyages playing as a bandsman on the Cunard liners Saxonia and Carpathia. Moreover, it has always been known that Titanic’s pianist also knew how to play the cello. Because Brailey had studied cello at the Royal Military School of Music, he fits the description of someone who was primarily a pianist, but had cello as a secondary instrument. 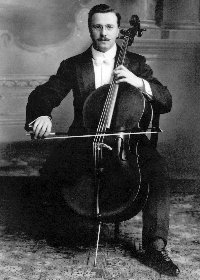 He was awarded a certificate in 1906 that stated he had achieved a “good deal of proficiency” on the cello. The word “proficiency” itself implies that Brailey had not exactly mastered the cello, but had learned it fairly well. In other words, it is much more likely that his piano skills still exceeded his skill on the cello, which made it far more likely that he went on to play piano professionally. Perhaps the most compelling evidence of all that Brailey was Titanic’s pianist: just prior to embarking on Titanic Brailey had been playing in a band on another ship, the Carpathia, with Roger Bricoux, also destined to play on Titanic. Brailey’s instrument on the Carpathia was the piano. The following quote from the New York Sun was typical of the press coverage of Taylor, the other bandsman thought to play piano on Titanic. Including the errors on Taylor, how many mistakes can you find? This particular New York Sun quote was so wrought with errors that it is difficult to believe the accuracy of the statement that Taylor played piano. But at the time, because most readers in the public assumed both ensembles had access to a piano, no one questioned that the Titanic had two pianists on board. The fact that Taylor had two instruments credited to his name suggests a bit of grasping on the part of the reporters. Perhaps to be safe, on the offhand chance they were wrong about the piano, they included the cello as a backup for good measure, copying the instruments attributed to Brailey. Cross had sailed with several of Titanic’s bandsmen prior to her maiden voyage. But as this was Taylor’s first gig on the open sea, it is unlikely that Cross knew him at all. It is possible that the above quote was completely made up and simply attributed to Cross. In the search for Titanic’s pianist, there is ample evidence to back up Brailey and no reliable evidence to support Taylor. We can therefore be confident that Titanic’s pianist was Theo Brailey. 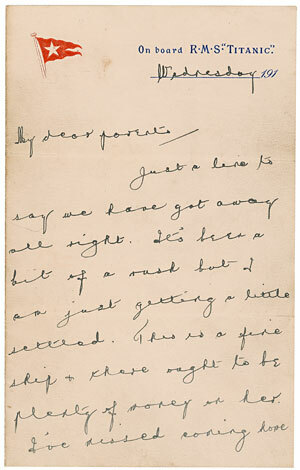 The next post on Titanic Piano will explore Percy Taylor’s role on Titanic. *Mr. N was Robert Douglas Norman, a Scottish Second Class passenger. 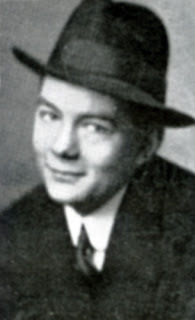 It was he who played piano for the Second Class hymn sing on the night of April 14, 1912. Titanic’s quintet: Who was the cellist? Three of the four musicians on board Titanic credited with playing cello were members of the five-piece band: Theo Brailey, Percy Taylor and Wes Woodward. 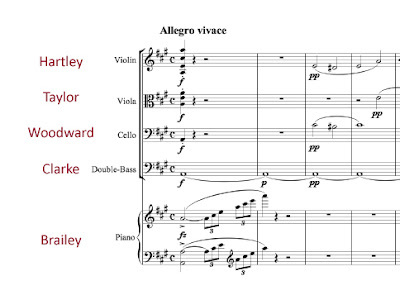 It would have been highly improbable for an ensemble of only five players to have more than one cellist, so it is necessary by process of elimination to decipher which one actually played cello in this ensemble on Titanic. Second Class passenger Kate Buss spoke of the cellist in a lengthy letter she wrote on board in installments throughout the voyage. It is certain that Buss was referring to the quintet’s cellist because she travelled in Second Class, and only the quintet played in that part of the ship. You will notice that she always spelled cello with an apostrophe. That is because cello is really an abbreviation of the real name of the instrument, violoncello, and Buss knew she was using the shortened name. In modern nomenclature the apostrophe has been dropped. The other point of interest is that she always spoke of the cello or of ‘cello man’ in the singular. Because Buss always referred to the cellist in the singular, we will continue the search for his name assuming there was only one cello in the quintet. There are three candidates for cellist: Theo Brailey, who studied cello, Percy Taylor, who has always been credited as playing cello, and Wes Woodward, a noted professional cellist. Theo Brailey is a candidate for the quintet’s cello position by virtue of the fact that he had studied cello. Although he was a recognized talent on the piano in his youth, two of the instruments he studied at the Royal Military School of Music just outside London, were cello and flute. Perhaps he studied these because he felt playing them would give him a better chance of filling a position in a military band. He received recognition in January 1906 for his progress with a “good degree of proficiency” on the cello and a “very good degree of proficiency” on the flute. It is unknown what the term “proficiency” meant in this context. Typically in university programs today a musician’s “principal applied instrument” is the main instrument of study. “Proficiency” classes are meant for the purpose of teaching basic skills, a general knowledge of a class of instruments. For example, an education student who hopes to teach high school band may major on the trumpet, their own principal applied instrument, but would need to have a general knowledge of all wind and percussion instruments, and so would take proficiency classes to learn how to play them all in a rudimentary fashion. Young composers are also often advised to learn how all the orchestral instruments work in order to compose effective music. In Theo Brailey’s case it is unknown how well he learned to play cello or flute, or whether his skill ever equaled that of his piano playing. So little is known about Percy Taylor as a musician that it is completely unknown what instruments he studied or where. There are no known professional performances on any instrument prior to the one on Titanic. The only source of evidence that he played cello and piano was from the posters published of the bandsmen after the sinking of Titanic. The few obscure statements about him in newspapers after the sinking suggested he was a pianist. In 1900, at the age of 21, John Wesley (Wes) Woodward received his teacher’s and performer’s licentiate from the Royal College of Music in London. There is ample evidence that he played cello professionally. In his mid twenties he performed with small ensembles in Oxford, then in his late twenties with the Duke of Devonshire’s Band, a privately funded orchestra that gave public concerts in Eastbourne. Prior to sailing on Titanic he had performed at the Constant Spring Hotel near Kingston, Jamaica, as well as on ships: White Star Line’s Olympic for the duration of her early career, and Cunard’s Caronia. In Buss’s letter she had mentioned a conversation with the cellist in which he had said he was on Olympic when she collided with Hawke. It is known Woodward was on Olympic from her maiden voyage until the day of the accident. This piece of information alone identifies him as the quintet’s cellist. One other Second Class passenger made mention of the quintet's cellist, now identified as Woodward. 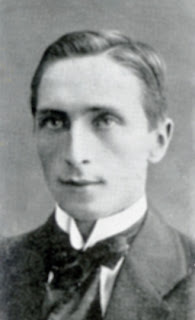 Lawrence Beesley wrote of his experiences on Titanic after the collision with the iceberg. Beesley watched the activity on the ship from the Starboard side of the Second Class section of the Boat Deck. As the bandsmen were also Second Class passengers, they would have used all the usual Second Class corridors and stairways, and would have been seen by their fellow passengers between performances. It seems as though the quintet accessed their performance venue at the top of the First Class Grand Staircase by ascending the stairs in Second Class up to the Boat Deck level, and then making their way along the length of the Boat Deck all the way to the First Class Entrance Hall. It can be believed that it was the quintet's cellist that Beesley saw because the Boat Deck led directly to the quintet's venue. As mentioned in a past post, the trio's cellist would have accessed the inner First Class Reception Room on B Deck from a crew stairway located inside the ship. One wonders--what had delayed Woodward, what had held him behind and caused him to rush? With Wes Woodward named as the quintet’s cellist, only two musicians remain to be placed in the ensemble: Theo Brailey and Percy Taylor. The next two posts will attempt to sort out the parts they played on Titanic. Titanic sailed with two small ensembles, a piano quintet and a string trio. A standard instrumentation for these instrument groupings would normally require only one cello each, with a total of two cellos on board. This account has led many to believe that Titanic sailed with more than two cellists. For if Laroche had witnessed two cellists in the quintet alone, perhaps that meant there were three cellists on board. 1912 press reports seemed to reinforce this, listing as many as four cellists: Roger Bricoux and Wes Woodward playing cello only, and Percy Taylor and Theo Brailey playing both cello and piano (one instrument or alternating on both). In her letter Laroche identified the piano, only one violin, two cellos, and made no mention of a stand-up bass. In the interest of considering all the evidence with a fair look, let’s assume for a moment that Juliette Laroche’s account was accurate and that there were indeed two cellos in Titanic’s quintet. There are several important musical considerations to keep in mind when discussing the makeup of Titanic’s bands. Would the agents, C. W. & F. N. Black, have been able to provide written arrangements for an ensemble that consisted of that group of instruments? Would the music have sounded balanced with the voicing of those instruments? If the instrument lists that have been passed down to us are accurate, then figuring out the discrepancy in the number of cellos on board is the biggest obstacle in figuring out the matter of arrangements and sound. Sheet music arrangements for one violin, two cellos, double bass and piano simply would not have existed. 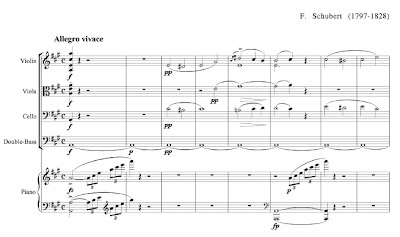 Here is an example of a complete score for piano quintet. Notice that the instruments appear top to bottom in the order of highest to lowest stringed instruments (violin, viola, cello, double bass), with the piano’s grand staff on the bottom. This theory suggests that C. W. & F. N. Black could not find a violist to sail with the ship, and at the last minute substituted a cello into the part. Musically, this would have been possible. Viola music is written in the alto clef, a clef that has a range between the treble and bass clefs. Cellos have such a large range, extending through bass, alto and treble clefs, that cellists are required to learn to read all three. Musically it would have been possible for a cello to perform a part written for a viola. This would have maintained a kind of balance in the ensemble, with the violin playing the soprano voice, cello 1 playing the alto voice, cello 2 playing the tenor/baritone voice, double bass carrying the bass, and the piano in all ranges, at times in the lead, sometimes doubling the strings, and still others providing a rhythmic backdrop to the strings. It is impossible to prove the Viola Substitute Theory, but it seems to be the only way to reconcile the instruments as they were listed in press reports after Titanic sank. The longer I think, the more I believe Juliette Laroche’s incomplete instrument list was also incorrect, having called the two large stringed instruments cellos when they were really one cello and one double bass. But how could an eye witness be wrong? Some historians have interpreted that Laroche saw the band perform in the Second Class Dining Saloon, taking the French word 'salon' and using it to suggest 'saloon.' After all, there was a piano in the Dining Saloon. If this were the case there would be no reason to question the accuracy of Laroche's instrument listing, as the piano and band would have been in full view of the audience in the Dining Saloon, and it could be assumed that she saw the instruments directly before her and wrote of them as an eye witness. However, upon deeper investigation it becomes known that the piano in the Second Class Dining Saloon was in place only for Divine Service on Sundays, not for regular performances, and that volunteer passengers, not bandsmen, played there. Titanic's hired band had only one known performance venue in Second Class, and it was in the Entrance Foyer on C Deck. In the ship’s design an upright Steinway piano was stationed in the Entrance Foyer just outside the Second Class Library door, and it was here that the band performed three times daily. Several details from Laroche's letter pinpoint this as the location of the concert: mention of the piano, her mention of hearing music while writing in the 'salon de lecture' (library is a more accurate translation than dining saloon), as well as her description of the band ‘next’ to her (the Entrance Foyer and Library were side-by-side). If it is true that Laroche wrote her letter while sitting in the Second Class Library, then a wall would have separated her from visual contact with the band. In reading Laroche's short description it can be assumed that she saw the band briefly as she walked by them on her way to the library, and had had but a quick glance at them in passing. The music would have been audible in the library, and she would have heard it while she wrote. But the fact that the band was out of sight caused her to provide her father, as well as generations of Titanic enthusiasts, with an inaccurate listing of instruments. As students of the Titanic, it is important to appreciate first person accounts as points of interest to be considered within a body of information rather than as absolute pieces of fact. It is the opinion of this author that Laroche heard Titanic's standard quintet in performance, but for some unknown reason listed only four out of the five instruments and erroneously listed two cellos where there was indeed only one. Did Titanic's band play their music by memory? 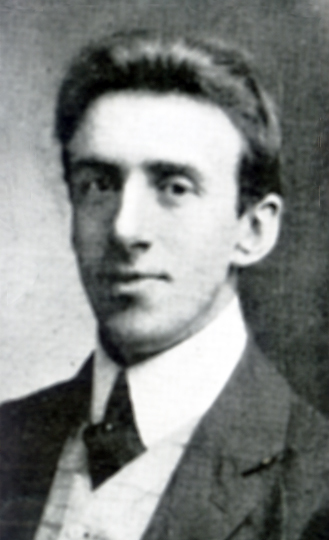 Titanic’s best-known musician has always been Wallace Hartley. It should be clarified that he became well known after Titanic sank, after the final brave performance. On the voyage itself he was simply one of the esteemed musicians who drew the attention of the ship’s more musical passengers, but was otherwise anonymous, not known by name. He has always been listed as Wallace Hartley, violin and bandleader. It is interesting that he has never been referred to as first violin, as Jock Hume was, but just simply as “violin.” The distinction is that Hume’s trio had two violinists, for where there is a first, there must also be a second. With Hartley violin is always listed in its singular form, so the deduction is that the quintet had only one. 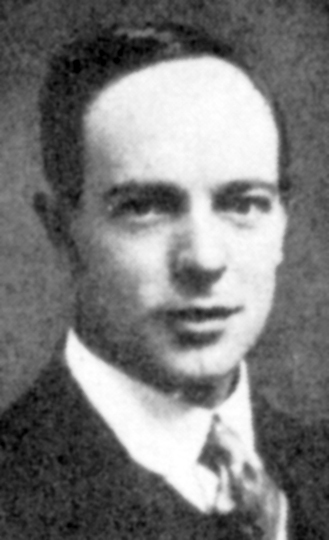 He was remembered by one of Titanic’s survivors, First Class passenger Helen Churchill Candee. And in describing a conversation she remembered from one of the quintet’s evening performances in the Reception Room on D Deck, she, too, used violin in its singular form. Hartley was the violinist in the ensemble of which Candee wrote. The “weak violin” comment is rather nebulous, for there have always been some troublesome audience members who like to express pretentious opinions about classical performances. This alone should not be used against Hartley as a testament of his skill as a violinist. Candee, herself, discounted the opinion citing that it was only for conversation’s sake. from Hartley to his parents. 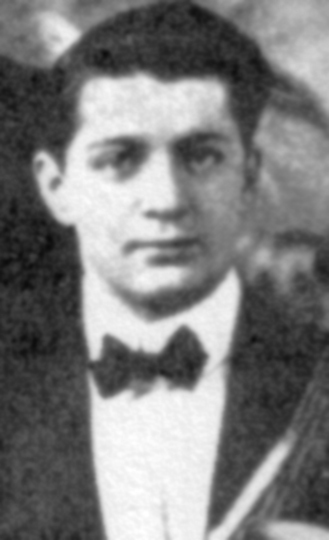 Hartley led the quintet in six one-hour performances each day of Titanic’s voyage. In Second Class they performed morning, afternoon and evening in the Entrance Foyer on C Deck. The remaining three performances were in First Class: mornings at the Boat Deck level of the Grand Staircase, and afternoons and evenings in the Reception Room outside the First Class Dining Saloon. It was at the Boat Deck level of the First Class Grand Staircase that Hartley led the quintet in Titanic’s most famous performance in the hours of the sinking. It was his five-piece band that played until the very end, heard by at least four survivors who remained on board the ship within minutes of the sinking. The final two numbers were a ragtime tune, identified by May Futrelle as Alexander’s Ragtime Band, and a waltz tune identified by Harold Bride as “Autumn” (Songe d’automne). Apparently the final number was cut short and the instruments abandoned. Although it has been widely circulated that the band played Nearer, My God, To Thee as the final number, no one on board the ship heard the band play a hymn within the last fifteen minutes. 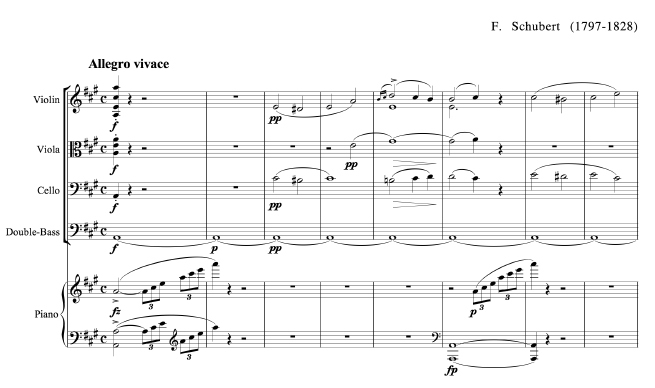 It is possible that the melody wafted on the air and heard at a distance by those in lifeboats was the opening passage from the introduction of Songe d’automne, which bears a striking similarity to the first phrase of Nearer, My God, To Thee. or possibly played by him on Titanic. 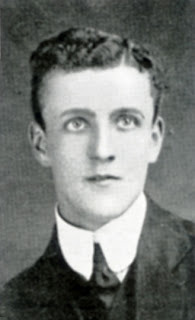 Hartley’s body was recovered from Titanic’s wreckage as body No. 224, returned to Colne, Lancashire and buried on May 18, 1912. It was estimated that upwards of 40,000 people showed up to watch the funeral procession and attend the funeral. His interment received extensive coverage by the international press. To this day several elaborate memorials or statues pay tribute to his service on Titanic. 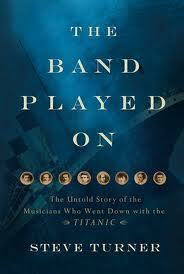 Where did Titanic's band play during the sinking? When did Titanic's band stop playing? Hi, I am Rebekah Maxner, a classically trained career musician and composer from Nova Scotia, Canada. I'd like to explore music and musicians on board Titanic. Have questions? Ask me!